Forrás: Daily Mail. Szerző: James Rush. 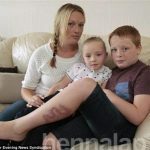 A mother fears her young daughter could be scarred for life after she suffered a severe reaction to a henna tatto while on holiday in Egypt. Sanah Younis, of Dewsbury, West Yorkshire, had the £10 temporary black henna tattoo on her forearm during a family break to Sharm El-Shikh over Christmas and New Year. 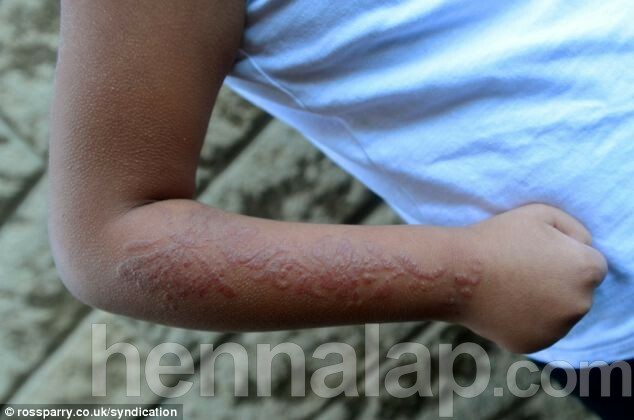 Her mother Rehana Younis said she was told the tattoo was ‘child-friendly’ by the man selling it, but within days Sanah started to feel pain and her arm became inflamed. Doctors have told Mrs Younis her daughter’s wounds may take years to heal. Mrs Younis, 31, said: ‘When we were still on holiday it looked like Sanah just had sunburn on her arm but when we got home after the holiday it got more blistered. ‘A few days later she went upstairs for a wash and I heard her screaming. I ran upstairs and she was in a lot of pain and crying. ‘I rang the doctors and they said to take her to A&E. We went to hospital and the doctor knew what the reaction was straight away because she’d seen it before. ‘The doctor has given us ointment which we are still putting on her arm but as far as I can see it’s not making any difference. The scar is still blistered and the pattern is still clear. The mother-of-three is now warning other parents of the dangers. She said: ‘The tattoos are offered everywhere and if you’ve got kids they keep asking. Henna is a natural plant extract which is often used without any ill effects to create temporary tattoos which are painted on to the body and fade away in under two weeks. But when henna, which is naturally red in colour, is mixed with black dye it can cause skin burns. It contains a chemical known as PPD which is known to cause severe allergic reactions. Some children are known to have been hospitalised after receiving the temporary tattoos and, in the most severe cases, sufferers can require plastic surgery. Black henna contains a chemical known as PPD which is known to cause severe allergic reactions. Sanah may also now have a lifelong sensitivity to hair dye. 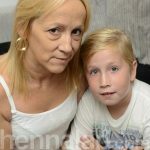 Mrs Younis said: ‘We know now that these black henna tattoos contain the PPD chemical and people need to know they’re not safe and shouldn’t be used on children. She said Sanah was too ashamed to remove her cardigan in school fearing what the other children will say about the scars.